In debates about whether or not to lift the ban on trade in rhino horn, the real puzzle is the curious positions and untested assertions of people who should be providing solutions. By DON PINNOCK. The desire to sell – for vast sums of illegal or stupidly spent money – the pointy bits of conjealed hair cut from the noses of rhinos is making people who should know better say extremely irresponsible things and the South African government risk international condemnation and embarrassment. Any therapist will tell you that the critical factor in trying to understand an issue is what’s not said. In the arguments of all these would-be traders of animal parts, there’s a ghost in the room that doesn’t want to come into the light of day. Rhinos are being heavily poached and are in danger of extinction. Their total wild population is roughly 29,000, the size of the human population in the village of Robertson. A hundred years ago there were half a million. There’s a strong lobby, which the government seems to be listening to, that insists the only way to save the rhino and stop it being a financial liability is to sell its horn to people who consider it medicine. This is in the face of an existing trade ban, worldwide opinion that the ban should remain in place and economic analysis which shows ending it would be a disaster for rhinos. The Minister of Environmental Affairs, Edna Molewa, is the highest authority in any decision to trade or not trade rhino horn. She has done courses in economic leadership, run a trade union and chaired a portfolio committee on trade and industry, but could not be deemed an economist. For advice she has quite rightly convened a 10-person ‘panel of experts’ to debate the matter, though who they are and how they were appointed is largely unknown to the public. What messages filter out from this process are variously confusing, untested, contradictory and on occasion deeply misinformed. This does not auger well for rhinos. Despite rapidly escalating rhino poaching (possible extinction between 2026 and 2030 at present escalation rates) and massive ivory poaching in the rest of Africa (about three elephants an hour), Momberg assures us that “[t]he country is ready to deal with any elephant poaching incidents”. But on the matter of rhino trading, exhortations only thinly disguise intentions. In the final paragraph we discover that the decision on whether to table a proposal (clearly to trade horn, given the existing ban) at the CITES meeting in 2016 will not be based on the advice of the panel of experts or the Parliamentary committee set up to deal with the matter and – here’s the clincher – “South Africa believes that legislating the trade in rhino horn will in no way contribute to increased poaching”. Why, then, one needs to ask, have a panel of experts? Dr Sam Ferreira, who’s one of the few known panel members, is much more than a press officer. He’s an experienced large mammal ecologist at Kruger National Park, so his views have far greater impact. So his latest paper on rhino strategies in the South African Journal of Science, written with Michele Pfab and Mike Knight, is more than puzzling. The paper’s heading is “Management strategies to curb rhino poaching”, with a subheading, “Alternative opinions using a cost-benefit approach”. It may be in a scientific journal, but has nothing to do with hard science. It’s merely an exercise in getting 30 mostly like-minded people in a room and tabulating their suggestions about rhino trading with complex mathematical formulae. Clearly the workshop contained few, if any, of Momberg’s mischievous people opposed to trading in horn. There is, of course, no reason why a workshop should not result in a formal paper. But, with world opinion increasingly turning against opening trade in rhino horn, such a paper in a scientific journal will undoubtedly be used by those who wish to sell as a being scientific justification for their views. Using it this way would be fraudulent. Then there are some utterly unproven economic howlers: “It was assumed that if supply is increased, reduction in price may result and the incentive to poach should decrease.” This completely misses the fact that the East is an unknown and virtually bottomless market and that rhino horn is being stockpiled there against the creatures’ extinction. One of the proposed scenarios, the unrestricted trade in horn, requires a “well-regulated trading mechanism based on free market principles and a centralised selling mechanism” which would “lead to a drop in horn price and decreased poaching”, an assertion so naive it hardly bears discussion. This approach, the participants admitted, might carry considerable challenges and costs (including lobbying CITES), but these would be “offset by increased financial gains” (one needs to ask for whom?). The paper has no solid, verifiable economic analysis of almost anything to do with trade in rhino horn and strategies to curb poaching, but the writers do have the good grace to say that “being mindful that our results are dependent on subjective assessments and understanding, as well as the persuasive powers of participants, the assessment is only indicative.” The only real puzzle is how it ended up in a scientific journal. So how would legally selling rhino horn save the rhino? This is an analysis seemingly avoided by Minister Molewa and absent in the ‘scientific’ paper purporting to deal with it. It is, however, taken on by two top Mexican economists, Alejandro Nadal and Francisco Aguayo, following research published by the Manchester School of Environment, Education and Development this month. They describe South Africa’s attempts to formulate wildlife trade policy on the basis of inadequate command of economic theory as “acts of recklessness”. One of the most conspicuous features in the economic analysis of wildlife trade, they write, is the level of misinformation about changes in market theory over the last six decades. With regard to proposals by those wishing to lift the CITES ban on trade in animal parts, “the uncritical use of theoretically discredited analytical instruments is a striking revelation”. This argument, say Nadel and Aguayo, relies on highly unrealistic assumptions, one of which is that legal trade is able to fully substitute for illegal trade. This points to a failure to understand illegal markets. Market legalisation, they suggest, would actually increase demand as well as provide avenues for illegal traders to launder poached products. The aim of the report is not to suggest ways to solve the poaching crisis, but to explore the consequences of lifting the CITES prohibition on trade in animal parts. To lift the bans, say Nadel and Aguayo, would be a disaster for creatures like rhinos and elephants in the wild. The report points to a number of naive and untested assumptions in pro-trade models. One is that illegal supply of products like ivory and rhino horn is more costly than a legal supply and can only survive if prices remain high. This is “simply an untested assumption” and also fails to recognise that the relatively small number of legal suppliers would have a powerful incentive to retain a monopoly and not lower costs. What’s noticeable in pro-trade literature, say Nadel and Aguayo, is the absence of reliable quantitative information that could be used systematically to tackle the question of how price reductions could possibly decrease demand. This literature ignores the fact that any business enterprise in a capitalist economy needs to develop its market and therefore invest resources in expanding demand. So a pro-trade position claiming to reduce the predation of wild rhinos and elephants would have to explain how it would factor in the market need to increase supply, especially after stockpiles are depleted. So what exactly is the ghost in the room of those who wish to sell rhino horn, be they national parks, private traders or large mammal ecologists? It can’t be conservation, though it’s touted as such, because serious analysis shows selling horn is not a conservation solution. Another reason often touted is to provide income for poor black landowners. But if the heavily defended Kruger Park can’t stop massive poaching, what hope have communities with a few rhinos to sell? The truth is that the ghost is money. 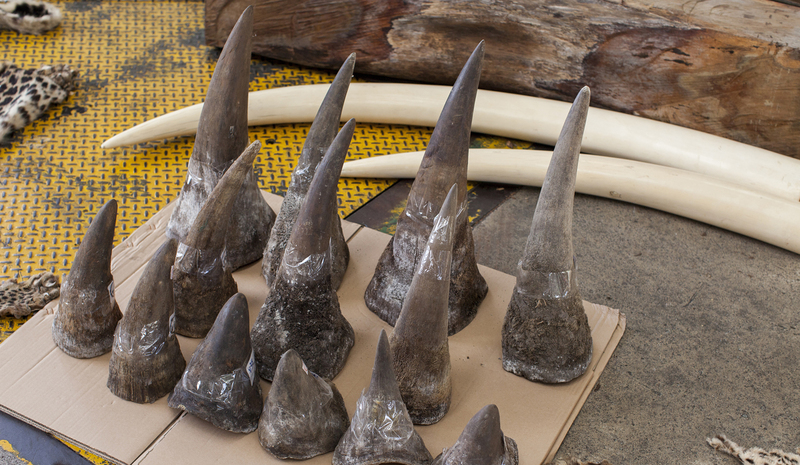 The present black-market value of rhino horn, weight for weight, is higher than gold. It would be wrong to suggest that a scientist of Sam Ferreira’s status is merely chasing the money. But he – and SANParks, who employ him – are incurring massive costs mounting 24/7 anti-poaching units and their stockpile of rhino horns and ivory must look like a tempting answer. This need harmonises with rhino breeders with rhinos to sell and high costs of their protection. One of these breeders is said to own more than 1,000 rhinos. One can sympathise, but not at the cost of possible extinction. But there’s another ghost in the room seemingly overlooked in much of the debate, and that’s the rhinos themselves. For conservationist and member of the Wilderness Foundation Ian McCallum, the rhino issue is ultimately an ethical one. “It’s a complex subject because it immediately begs a definition of what’s right or wrong and for whom: the rhino, the conservation budget or private or the communal land/rhino owners. Even if we are able to define the market, why are we trading a commodity that fuels a thoroughly absurd, unscientific and superstitious pursuit?